If you walk into a building that was once used for grain storage and your first thought is “You know, this would make a really great bar,” you either have a vivid imagination or you drink too much. Possibly both. Either way, Granary Tavern isn’t the first bar in the Boston area to use historical infrastructure as inspiration for modern design – in a town as old as this, you can enjoy cocktails in a former prison, beers in what was once a bank, and Southern comfort food at the site of a 17th-century printing press. But of all the bars that channel the spirit of their prior tenants, I’d have to say Granary Tavern does it best. As the name implies, Granary Tavern is housed in a former granary built in 1816 on the outskirts of what we now know as the Financial District. Iron machine gears and burlap sacks adorn the exposed brick walls, conjuring images of 19th century laborers happily threshing and bagging wheat and barley all the livelong day. It’s a big, open room with a light brown, hardwood floor, and a ceiling of exposed wooden beams that are vestiges of the original building. The effect is almost barn-like, which makes sense – the owners of Granary Tavern actually purchased a 19th century barn in Vermont and repurposed the wood for use throughout the bar. The structure absorbed nearly two centuries’ worth of New England sunrises, turning the wood a deep amber hue and giving this months-old bar a sense of age and character. But amid the rustic backdrop are all the right modern amenities – two floors’ worth of craft cocktails, microbrews, comfort food classics, and a few mammoth TVs. The floor-to-ceiling windows, which offer a beautiful view, open up in the warmer months, and there’s an outdoor patio as well. 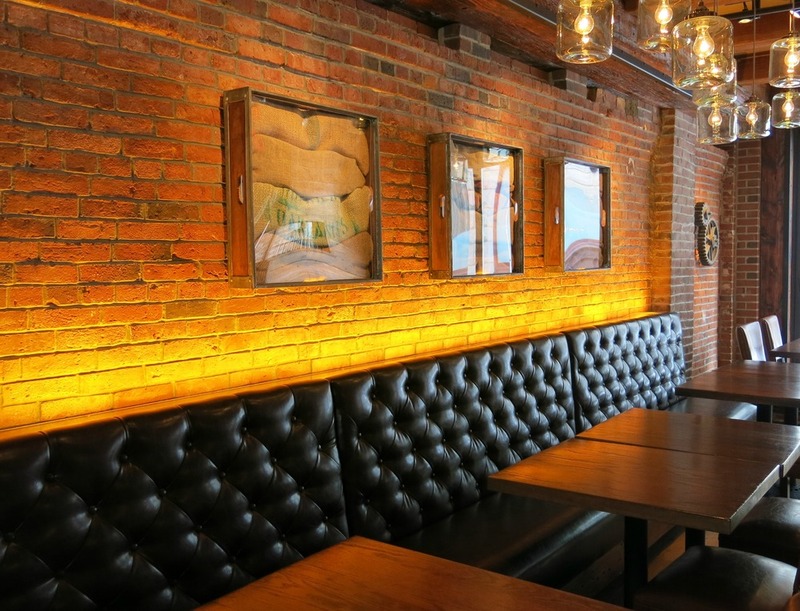 A brick wall divides the upstairs space into two large rooms, each with plenty of tables, and a 12-seat bar extends into both rooms. Hanging pendant lights create an industrial vibe, and the whole place is bathed in an orange glow. I’d been wanting to check out Granary out since it opened last fall, and I finally visited a week ago. It’s popular – there was already a crowd of about 50 people when I arrived around 5:15, but in a place that can accommodate 250, it didn’t feel too congested. What was congested on this particular Friday evening was Storrow Drive, delaying the arrival of fellow barhoppers Kelly and Melissa. Troubled by their plight as I was, I considered abandoning the bar and waiting outside, suffering with them in solidarity, despite the miles that separated us. Instead I perused the drink menu. Like so many places these days, Granary Tavern offers a bevy of craft cocktails. But the options here have a distinctly personal touch – each bartender contributed at least one original drink recipe, and the current menu is in something of a “tryout” phase. The most popular concoctions stick around longer, so there’s a spirit of friendly competition among some of the bartenders. The winner, of course, is those of us on the other side of the bar. I began the evening with a Revolver, made with Bulleit bourbon, coffee liqueur, blood orange bitters, and an orange garnish. It was kind of like a coffee-infused Manhattan, which definitely isn’t a bad thing. I’ve been noticing Bulleit in a lot of drinks recently, and I can see why discerning bartenders like using this bold, spicy, and smooth bourbon in their cocktails. Next up was the Tavern Sling, an exquisite mix of Hendrick’s gin, St. Germain, mint, simple syrup, and fresh lime juice, with a splash of soda. I recalled from my intense studies at the Hendrick’s Cocktail Academy what a good pairing Hendrick’s and St. Germain can be, and this was no exception. The mint and lime, along with the sweetness from the syrup, naturally made me think of a mojito. But the gin gave it more bite, and the St. Germain contributed a soft, floral warmth. “That’s one of the ones we’ve had from the beginning,” the bartender, Colleen, told me. I can see why. It was a little after 6 when Kelly sauntered in, and by then the whole place was pretty full. 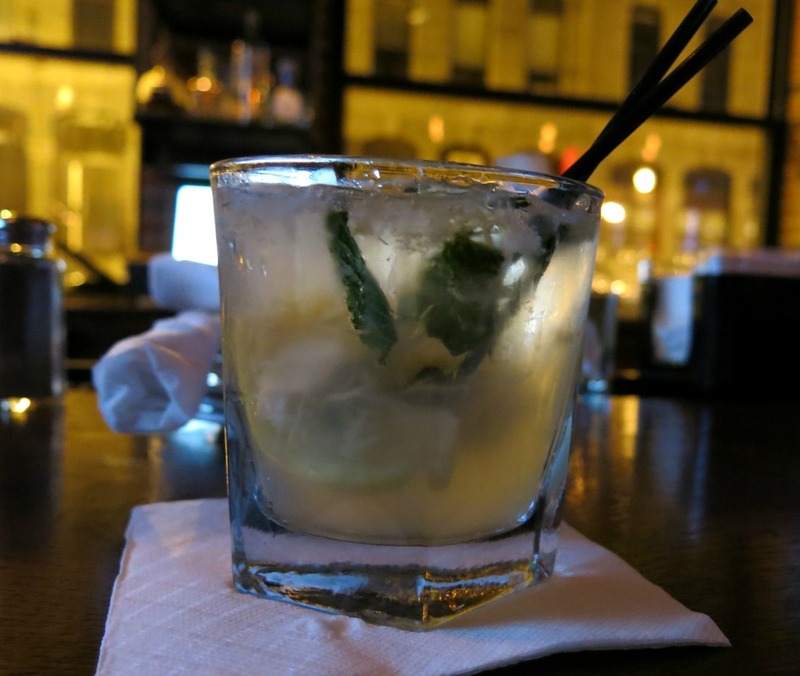 Kelly ordered the Granary Smash, a recipe contributed by another of our bartenders, Tiffany. This one combined Patron Silver, St. Germain, orange juice, and fresh lemon juice. It was the first time I’d encountered St. Germain mixed with tequila, and not surprisingly, it worked well; I’m beginning to think St. Germain works with pretty much anything. Every drink on the menu sounded appealing, particularly some of the seasonal options, like Granary’s version of a hot toddy. Unable to decide, I asked Colleen for a recommendation, and she chose the Winter Sangria (one of her own recipes). It’s funny, but in looking at the menu, I skipped right past this one. For some reason, the name gave me the same feeling I get when I see “white” in front of “zinfandel.” I’m glad I took the suggestion, though, because this was one of the highlights of the evening. Merlot, cinnamon simple syrup, and a cinnamon stick made me think of a chilled mulled wine, well suited to the winter weather, while lime juice and soda provided subtle hints of the warmer months ahead. After a leisurely two-hour drive, Melissa finally graced us with her presence around 7 and ordered a glass of Malbec. I prepared for the worst when we put our name in for a table, but despite the crowd, the wait was only an hour (not bad at all for a Friday night). We ordered some appetizers to take the edge off while we waited. To that we added “chicken fried chicken,” and no, I don’t know how it got that name. What I do know is that the chicken was crispy outside and tender inside, and it came with more of that rockin’ dip. With a little food to sustain us, another round of drinks was in order. Kelly opted for the elegant Ginger Rogers, made with vodka, ginger liqueur, freshly squeezed lemon, mint, and a splash of ginger ale. Melissa went with the Cinnamon Toast Crunch, the flavor of which bears an almost eerie similarity to the cereal you remember from your childhood (if you’re still eating it as an adult, no judgment). 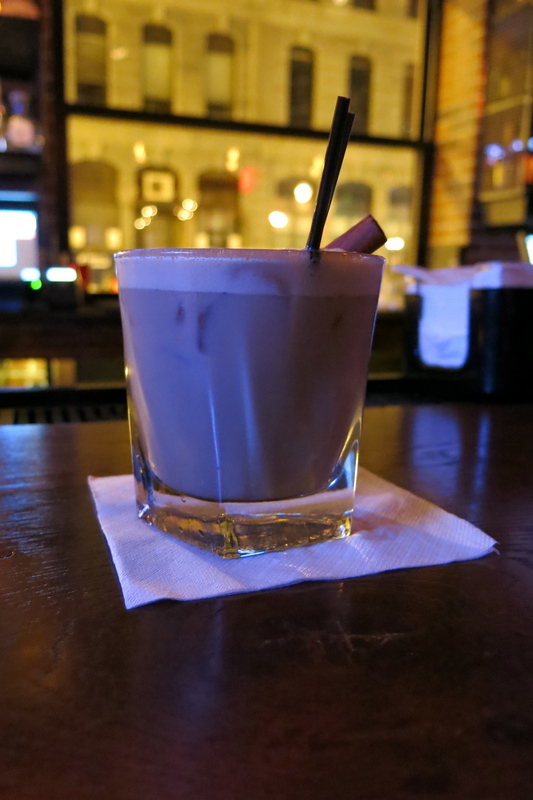 This creamy concoction was made with Patron Café, vanilla vodka, Baileys, and cinnamon syrup, and was again the handiwork of Tiffany. Sinful, decadent, and delicious. I, meanwhile, was happy to explore Granary Tavern’s fine beer selection and settled on a Lagunitas. There are 10 beers on draft and plenty of bottled offerings, with a good selection of microbrews and an emphasis on local fare. We’d been waiting less than an hour when the hostess told us there was a table available downstairs. The lower floor is a little smaller and a bit less crowded than upstairs. It has its own bar, with a dozen stools, and features a custom tap built from old iron plumbing pipes. The ambiance is similar to that of the main floor, but with its stone walls and concrete floor, the downstairs feels more like a cave (albeit a really nice cave). And that stonework isn’t just for aesthetics; it’s the original sea wall, still in place from the 1800s. We settled in for dinner and ordered up a bowl of spiced popcorn while acquainting ourselves with Granary’s sandwiches, flatbreads, and comfort food entrees, all made with locally sourced ingredients and jazzed up wherever possible. The cheese fondue made with Harpoon IPA was particularly tempting, as was the chicken and waffle. Kelly went with the fish and chips, which has become her customary order despite her complex relationship with seafood. Melissa opted for the roasted beet salad, which she loved; the goat cheese and pumpkin seeds sounded like inspired additions. Given my hatred of beets, however, I’ve made the picture as small as possible. Which is too bad, because it was cool-looking, too. I got the blackened catfish sandwich, which was spicy and tender and came with more of those delicious homemade potato chips. Dinner was a pretty relaxing affair. Kelly ordered a Tavern Sling, which I’d recommended from upstairs. And since I can almost never resist it when I see it on draft, I closed out with the smooth, smoky stylings of a Kentucky Bourbon Ale. We hung out for a bit after we ate, soaking up the cool downstairs vibe and enjoying the excellent soundtrack of Modest Mouse, Franz Ferdinand, MGMT, and the Killers. After months of wanting to come here, I was really glad this place didn’t let me down. I’ve been in plenty of new bars that use their style and popularity as a license for pretension; I got no sense of that here. The atmosphere was very casual and we had great service all night. There’s a lot at Granary that will change – I’m told the menu will fluctuate with the seasons, the drink list will always be in flux, and the respectable beer list will rotate frequently. But there’s a fresh, friendly, even humble attitude here that I hope will stay exactly the same. The food’s good, the drinks are great, and the setting is incredibly cool. What really stands out about Granary Tavern, though, is that it conveys the spirit of a small operation. And that’s unexpected; nothing about it is small, and I’m not just talking about the impressive size of this two-floor bar. It’s owned by the Glynn Hospitality Group, which runs seven or eight other bars in Boston. Call me cynical, but with that kind of corporate backing, I wouldn’t have been surprised if Granary felt prepackaged and rigid. Instead, I detected the energy and enthusiasm I’d normally associate with a newly successful, homegrown business. From the hostess to the bartenders to our waitress, the staff seemed earnest and genuinely friendly. The bartenders, perhaps by virtue of participating in the drink design, exhibited pride and a sense of investment in their cocktails. Every time I ordered another drink, the person who made it would come by and ask what I thought of it. That’s a small thing, but it says a lot. I also appreciated Granary Tavern’s general manager, Nikki, taking time to meet with me and tell me more about this very cool place. Granary’s prices are fairly typical. The cocktails were all $10, which is pretty much the going rate, and most of the beers were $6 or $7. Sandwich and entrée prices are a little high, but not outrageous. My catfish sandwich was $15, Melissa’s roasted be*t salad was $9, and Kelly’s fish and chips were $17. Snacks and appetizers are reasonably priced – $3 and $4 for the popcorn and garlic chips, respectively, and $10 for the chicken fried chicken. Whenever I’ve mentioned this place to someone, particularly its being built in a former granary, I get some variation of “Oooooh, that sounds cool.” Yes, it does sound cool; the concept is enough to lure you in at least once. 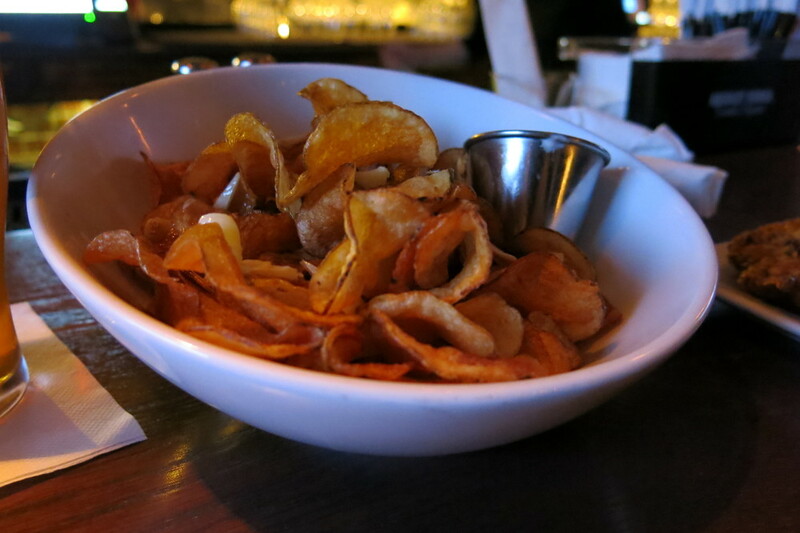 But Granary Tavern rises above the novelty of its setting and seems poised to thrive.